Lauren Beacham's necklace is a wearable tribute to the Heart nebula. Inspired by the romantic mysteries of the galaxy, fine art photographer turned jewelry designer Lauren Beacham created this wearable tribute to the Heart Nebula. The Valentine-worthy cloud of crimson hydrogen in the constellation Cassiopeia offers a nerdy gift alternative to traditional heart-shaped jewelry for sweethearts, bridesmaids, stylish space travelers. 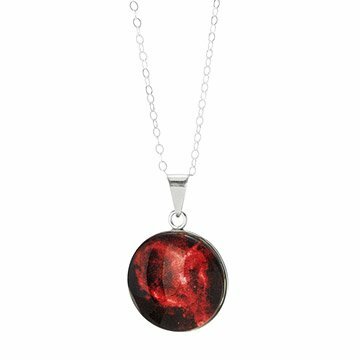 A giclee print of the nebula is showcased under domed glass and set in a sterling silver bezel on a sterling silver chain. Handmade in Maryland. Item is not waterproof - please avoid getting wet. To clean, use a soft dry cloth. To prevent tarnishing, store in an airtight plastic bag when not being worn. Very pretty, and a good size. It seems small, but when worn really stands out. My daughter loved this necklace so much!!! My daughter wears this necklace every day! bought this for a gift for Valentine's Day. She loved it, very unique and special. Love how it matches the cuff links. Good clasp.